Thomas Nuttall The Genera of North American Plants and a Catalogue of the species to the Year 1817. Philadelphia: Printed for the Author by D. Heartt, 1818. Courtesy The Library Company of Philadelphia. There are many kinds of bookmarks, and most often those that are attached to bindings are silk ribbons. 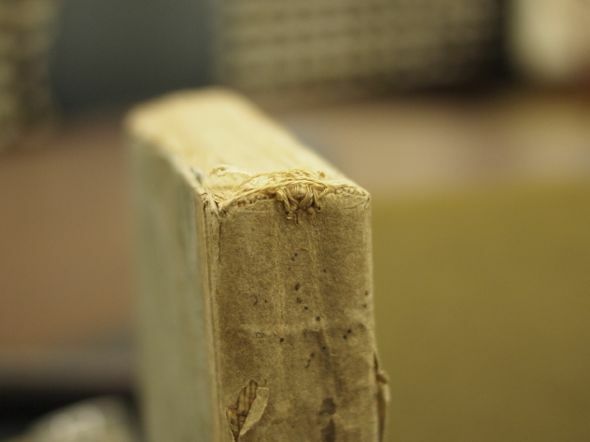 This owner made bookmark, which is on a boards binding, almost crosses the line into becoming a kind of oddly knotted end band, which boards bindings never originally had. The fourteen separate threads are sewn into the spine, and were used to mark the pages of this presumably frequently consulted catalogue of plant species. It also seems to have stabilized the binding a bit at the head, where the spine on these bindings often delaminates. It is also evidence against once strongly held notions that boards bindings are “temporary”. 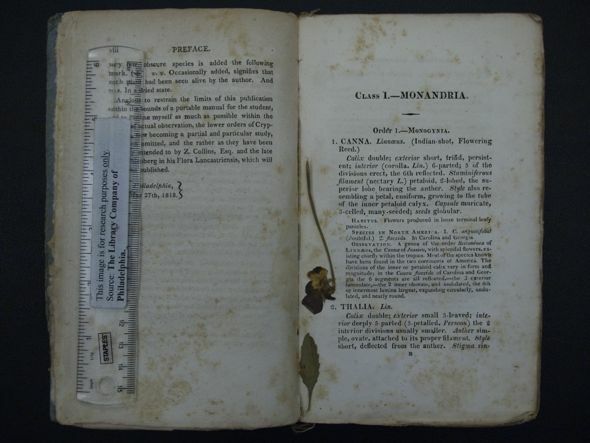 This binding not only displays considerable use (dirt, stains, flower and leaf storage) but the owner consulted it enough to warrant take the time to install this method keeping track of multiple places at one time, and used the book in the field.